While doing some online window shopping I came across a unique piece of art at Restoration Hardware… with an equally unique price tag of $199! (gasp) The collage alone is $1200. I remembered seeing some aged skeleton keys at a local antique shop a while back so I ventured over to see if I could recreate my own key art. I was able to find the keys for $2-$5 depending on the size. 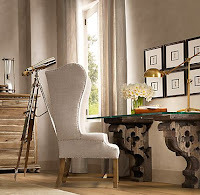 I actually prefer the aged look over the polished look Restoration Hardware offers. 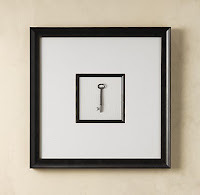 When purchasing frames keep in mind you have to allow depth for the keys. I was able to find some at Michaels Arts & Crafts on sale for $12. They have the matting already in them similar to the look we are trying to create. I also purchased a quarter yard of neutral toned fabric for a back drop behind the keys. The cost was $1.50 at JoAnn Fabric. To assemble, first play around with the layout of the keys. I chose to have multiple keys in some of the frames. When you have it figured out, take some spray adhesive to attach fabric to the paper insert that came with. Smooth it out to ensure no wrinkles. Next, hot glue the key(s) in your desired configuration. 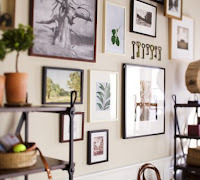 Layer the matting and key in the frame and simply hang on the wall. Tip: Some of my keys were so thick I had to duct tape the back flat against the frame. It has held up great. 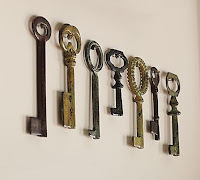 Tip: If you cannot find an antique shop try Kennedy Hardware , House of Antique Hardware or Pottery Barn online for skeleton keys.